China has stressed that particular attention must be directed towards hunger and unemployment in a number of countries by the Millennium Development Goals (MDGs) of the UN. Implementation of MDGs are crucial to advance peace, development and cooperation in the 21st century, said Chinese Foreign Minister Wang Yi on Wednesday. Wang was addressing the opening plenary session of the United Nations’ special event following up on efforts made to achieve the MDGs. 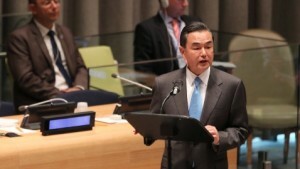 “In advancing the development agenda, we must cherish peace as we do our eyes,” Wang said. He urged that the UN development agenda must prioritise poverty reduction. Countries should work together to uphold an open, inclusive and growing world economy, so that more developing countries could integrate into the global value chain and benefit from it, said Wang. China, however, warned that there should be a critical eye on local conditions while pursuing development goals. “In advancing the development agenda, it is important to respect the national conditions of each country”, he said. World leaders meeting at United Nations headquarters on Wednesday adopted an outcome document, which acknowledges the progress made since the eight global targets were set in 2000. Wang claimed China is the first developing country to meet the poverty reduction goal ahead of schedule, and has made important contributions to South-South cooperation. A recent statement by China’s Ministry of Foreign Affairs has urged support for the African continent in furthering the MDG’s ahead of 2015. “The development agenda should give top priority to the difficulties and challenges that developing countries, especially African and Least Developed Countries face, tackling the development imbalances between the North and the South,” it said. Agreed by world leaders at a UN summit in 2000, the MDGs set specific goals on poverty alleviation, education, gender equality, child and maternal health, environmental stability, HIV/AIDS reduction, and a global partnership for development. The targets that have already been met include halving the number of people living in extreme poverty and providing more than two billion people with access to improved sources of drinking water. Countries have also made great strides on health targets, and are within close reach of achieving them by 2015 deadline. These include reducing the mortality rates from malaria and tuberculosis and stopping HIV infections.